Liverpool battled and battled but couldn’t seem to find a winner. Then Tottenham did it for them. Toby Alderweireld’s own goal right before stoppage time at Anfield sealed a 2-1 Liverpool victory that keeps the Reds in first place for another week, and just by the skin of their teeth. 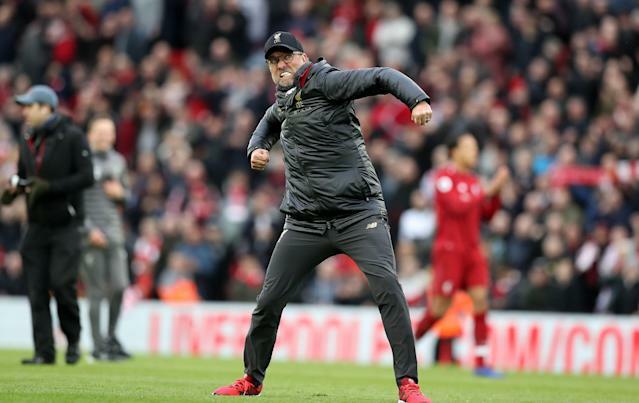 Liverpool’s Premier League era history is rife with whimsical moments that spilt away title challenges, yet on Sunday, such a moment went in the Merseyside club’s favor. 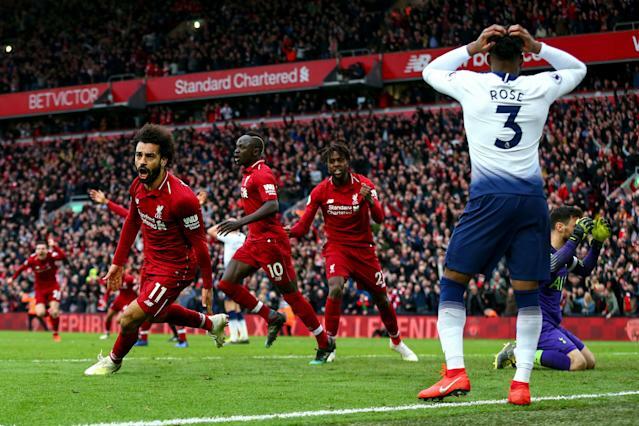 Having spent nearly 20 minutes searching for a winner after Spurs pulled level through Lucas Moura, Liverpool’s Mohamed Salah headed a ball back into the middle of the box, and Spurs’ nightmare sequence began. Agony for Spurs. Ecstasy for Anfield. These three points will likely prove significant. Tottenham is the best team remaining on Liverpool’s league schedule, and while the home fixture vs. Chelsea in two weeks won’t be easy (and will rekindle some unwelcome memories), a signpost of sorts was passed on Sunday. The Reds are two points up on Manchester City, which has a game in hand. But those results are never guaranteed, even for a giant like City, and Liverpool is setting a championship-level pace. Moreover, Spurs will face City a whopping three times in 11 days in mid-April, including a pair of Champions League tilts and – more relevant to Liverpool’s domestic interests – a league game at the Etihad. So excuse the Reds and their supporters if they’re a bit thrilled at the moment. There were questions over whether the ball was still rolling when Kane took the set-piece, which is against the rules, but only the strictest of enforcements would have denied Spurs such a well-worked goal. From there, Liverpool cycled through the kind of moments it hasn’t converted in title chases before. There was a free header for Virgil van Dijk that he missed, and the ball fell to Roberto Firmino, who didn’t expect it to and couldn’t do anything with it as a result. Divock Origi’s free kick in the 80th minute took a deflection, left Lloris beaten ... and rolled wide. Two minutes after that, van Dijk played forward another one of his beautiful long balls that was just a few feet out of Sadio Mane’s reach. Spurs are still third in the table despite the loss, but their spot is tenuous. Tottenham has lost four of its last five Premier League matches, and Manchester United is level on points with the North Londoners, trailing only on goal differential. What’s more, bitter rival Arsenal will play Newcastle at home on Monday and could move up to third by the evening. Liverpool had the upper hand for a good portion of Sunday’s match until Moura’s goal, and perhaps those fruitless demons are the real opposition the hosts overcame. Liverpool certainly didn’t Sunday. Unfortunately for Spurs, they made sure of it.